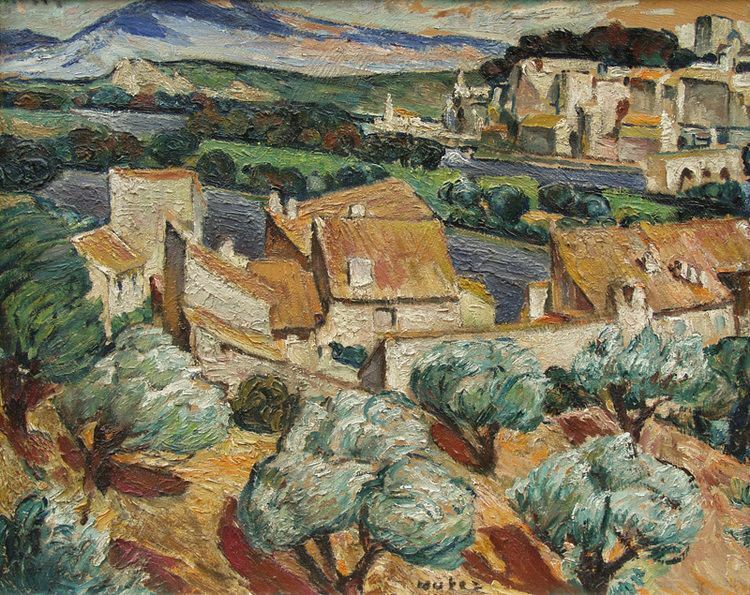 Avignon ([a.vi.ɲɔ̃]; Latin: Avenio; Occitan: Avignoun, Occitan: Avinhon [aviˈɲun]) is a commune in south-eastern France in the department of Vaucluse on the left bank of the Rhône river. Of the 90,194 inhabitants of the city (as of 2011), about 12,000 live in the ancient town centre enclosed by its medieval ramparts. 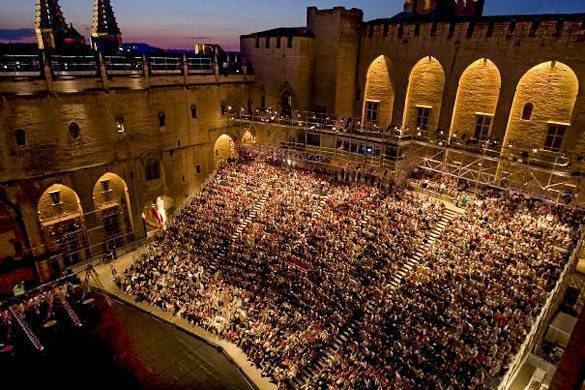 Avignon is situated on the left bank of the Rhône river, a few kilometres above its confluence with the Durance, about 580 km (360 mi) south-east of Paris, 229 km (142 mi) south of Lyon and 85 km (53 mi) north-north-west of Marseille. 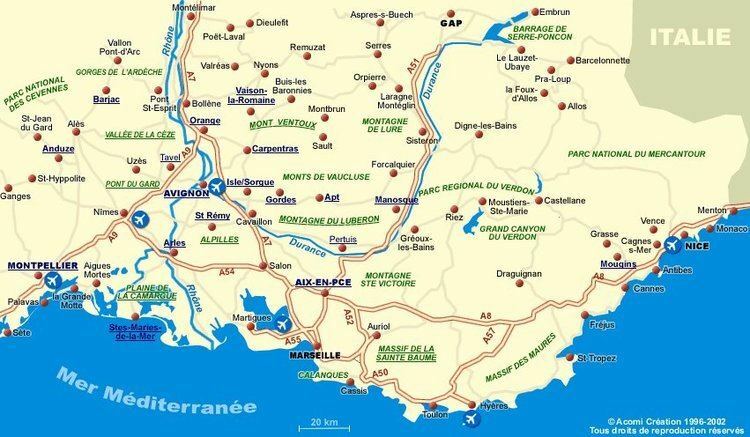 On the west it shares a border with the department of Gard and the communes of Villeneuve-lès-Avignon and Les Angles and to the south it borders the department of Bouches-du-Rhône and the communes of Barbentane, Rognonas, Châteaurenard, and Noves. The Durance flows along the southern boundary of the commune into the Rhone and marks the departmental boundary with Bouches-du-Rhône. It is a river that is considered "capricious" and once feared for its floods (it was once called the "3rd scourge of Provence" as well as for its low water: the Durance has both Alpine and Mediterranean morphology which is unusual. The presence of faults in the limestone substrate shows that significant tectonic shift has caused earthquakes in different geological ages. The last major earthquake of significant magnitude was on 11 June 1909. It left a visible trace in the centre of the city since the bell tower of the Augustinians, which is surmounted by an ancient campanile of wrought iron, located in Rue Carreterie, remained slightly leaning as a result of this earthquake. In 2010 the commune had 89,683 inhabitants. The evolution of the number of inhabitants is known from the population censuses conducted in the commune since 1793. From the 21st century, a census of communes with fewer than 10,000 inhabitants is held every five years, unlike larger communes that have a sample survey every year. New Haven (USA) since 1993. The MIN area of Avignon is the Agroparc area (or "Technopole Agroparc"). The Cristole area is contiguous and both have a little less than a hundred establishments. Only EDF (Grand Delta) with about 850 employees and Onet Propreté with just over 300 exceed 100 employees. The Transports en Commun de la Région d'Avignon, also known by the acronym TCRA, is the public transport network for the commune of Avignon. Two tram lines are projected to open in 2016 with works expected to begin in late 2013. Notre Dame des Doms (12th century), the cathedral, is a Romanesque building, mainly built during the 12th century, the most prominent feature of the cathedral is the 19th century gilded statue of the Virgin which surmounts the western tower. The mausoleum of Pope John XXII (1334) is one of the most beautiful works within the cathedral, it is a noteworthy example of 14th-century Gothic carving. Palais des Papes ("Papal Palace") (14th century) almost dwarfs the cathedral. The palace is an impressive monument and sits within a square of the same name. The palace was begun in 1316 by John XXII and continued by succeeding popes through the 14th century, until 1370 when it was finished. the old Hôtel des Monnaies, the papal mint which was built in 1610 and became a music-school. Pont d'Avignon (the Pont Saint-Bénézet). Only four of the twenty one piers are left; on one of them stands the small Romanesque chapel of Saint-Bénézet. But the bridge is best known for the famous French song Sur le pont d'Avignon. AC Arles-Avignon is a professional French football team. They compete in Ligue 2, having gained promotion from Ligue 3 in June 2009. After a season 2010–2011 competing in Ligue 1, the Arles-Avignon team came back in Ligue 2. They play at the Parc des Sports, which has a capacity of just over 17,000. On 8 July 2008 waste containing unenriched uranium leaked into two rivers from a nuclear plant in southern France. Some 30,000 litres (7,925 gallons) of solution containing 12g of uranium per litre spilled from an overflowing reservoir at the facility – which handles liquids contaminated by uranium – into the ground and into the Gaffiere and Lauzon rivers. The authorities kept this a secret from the public for 12 hours then issued a statement prohibiting swimming and fishing in the Gaffiere and Lauzon rivers.